Posted byJocelyn	 November 11, 2018 November 11, 2018 Leave a comment on Who, Me? My friend Helen, a colleague at the university, arranged the whole thing. 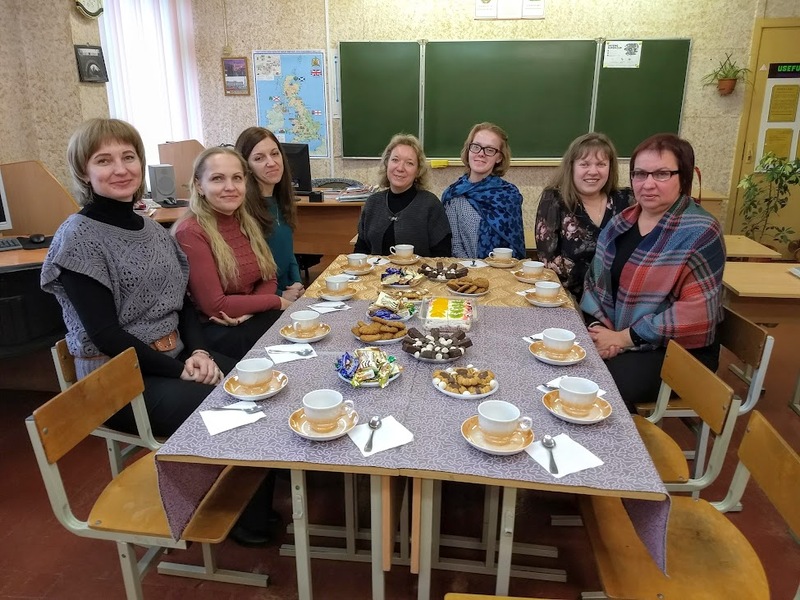 Weeks ago, Helen pinned down a date when I’d be free to visit her son Sasha’s gymnasium (an academically advanced K-12 school) — the same gymnasium she, herself, attended — and spend some time talking to the English teachers. The idea was born one Monday after Sasha’s teacher asked him what he had done the previous weekend; when he told her he had spent time speaking English with an American, her eyebrows shot up. “Alexander, you can’t tell stories,” she chastened. The very idea that one of her students had been speaking English with a native speaker…why, she’d had five years as an English major at university and been teaching for quite some time, all without ever encountering a native English speaker. That this nine-year-old said he had spent time with an American and spoken English to her was preposterous! So an idea was born. Well, all right, then. Yes. This would be the next of a breath-taking many. When I wrote my Fulbright proposal, I outlined a plan where I would teach two university classes along with an extra hour each week devoted to something more “conversational,” say a club or a group or something. It was this proposal that Fulbright accepted and is giving me grant monies to complete. The reality, of course, has far exceeded that accepted proposal. Yes, I teach two classes at the university, but instead of a club or casual conversation group, I also teach a class of combined sections of students for the university’s language center in the neighboring city each week, along with, more recently, sometimes helping out with the language center’s Friday night club meetings. Beyond that, I have been going on Fridays to a local gymnasium to work on oral communication with some of their students who are preparing for the Language Olympiad competition season. Filling out the schedule have been the times when colleagues catch me in the hallway or in the middle of town and ask me to visit their classes and give a couple sections of students 80-minute guest lectures on, say, travel. Oh, and the conferences — there’s also presenting at conferences, like the one in Minsk in September, the one in Polotsk in early October, the one next week in Minsk in mid-November. And then there was the time last month when I was on a day-trip with a gymnasium to visit a school in a town about an hour-and-a-half away when one of the teachers from the school recognized me from the conference in Minsk, told me it was her birthday, and exclaimed that seeing me at her gymnasium was the best present she could imagine…oh, and also, when could I come back to give a talk to the students at her school? Later that same day, a gymnasium student asked me for private lessons to help her with verb tenses, something which, as a teacher of native speakers, I’ve actually never taught. You need help with modals? Uh, I might need to google “modals” first, k? And then prepare a series of 45-minute lessons on the past perfect and future continuous, to boot? On top of all that, there are the wonderful, heart-moving students who want to meet periodically at a coffee shop for a few hours of English conversation practice. Oh, and all the ladies in my fitness classes who walk home with me to practice their skills. All of which is to say: my throat is scratchy, I had to stop saying yes to everything because the overwhelmage was making me cry when I was alone in my apartment, and my biggest challenge the past two months has been figuring out what “balance” looks like during an experience that is unique to anything I’ve ever known. How do I know when I’m doing enough? How do I know when it’s okay to draw the line? Is it acceptable to push back when participation seems mandated more than chosen? How can I possibly say no to the kindest, loveliest people in the world? Can an introvert who plays an extrovert on tv come out the other side of Fulbright Belarus without being shredded into a knotted tangle of gratitude and exhaustion? Is coming out the other side as a knotted tangle of gratitude and exhaustion actually the goal — because, in the long term, I won’t remember the exhaustion, but I will always remember the gratitude? In any given moment, I still don’t know the answers to these questions, but I’m trying to figure out the pacing so that each day feels like everyone’s needs have been considered. On my side, I need lots of hours alone, long stretches in front of the computer, a book, or a puzzle. Without those chunks of time for retreat and battery recharging, I feel a scream of hysteria rising from my gut. 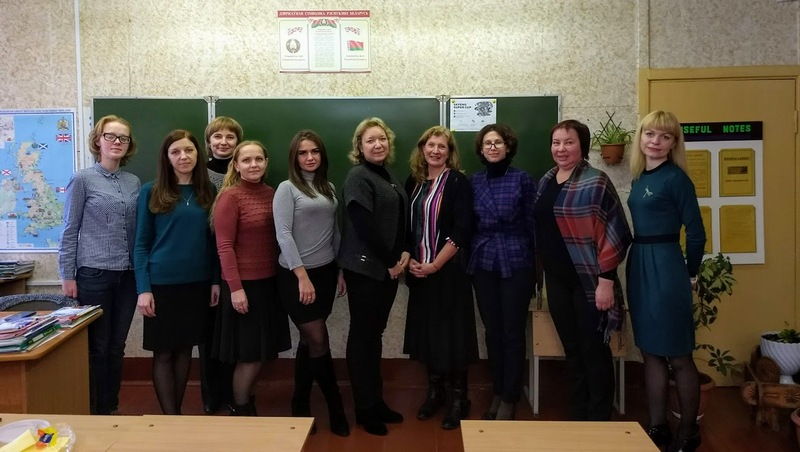 At the same time, though, I am here for a reason: to make connections, get into rooms with Belarusians who want to learn and practice English, and learn more about this corner of the world. Even more, on the days when I don’t have any formal commitments, the hours can get long, and sometimes by nightfall, I feel flat and grey inside. Thus, this past Monday, usually a day off, saw me visiting one of the gymnasiums in Novopolotsk. I had done a quick weighing of my internal balance — and the answer that emerged was yes. The engine in this plan, Helen drove me there in between teaching her own classes. Every time I am with women in Belarus, I appreciate their can-do energy, such a remarkable counterpoint to my own do-I-have-to energy. As we drove, I asked her, “Your days are always so full. Do you like it that way?” Oh, yes, she thrives off being busy — looks for things to keep her occupied, in fact, if there’s a lull. Wow. What would it feel like to be wired like that? Does this mean Helen actually gets a full night’s sleep before she heads into the classroom instead of lying awake, blood running cold with fear and adrenaline, for three hours before the alarm goes off? WHAT WOULD THAT FEEL LIKE, TO BE RESTED AND SANE BEFORE WALKING INTO A ROOM OF EXPECTANT FACES? I could learn a lot from Helen. We walked through the doors of the gymnasium, laughing, our heads turned towards each other as we hooted, but, hey, oh, oops, suddenly I realized some sort of event was happening at the school, so perhaps we should tone it down, lest we interrupt. Standing inside the main doors were three lovely girls dressed in costume, and nearby was a chic woman holding a camera with a long lens. Ooooh, it looked like the gymnasium was hosting An Event! Would I maybe get to peer into an auditorium and watch a few minutes of a performance? Yessssss. Subtly, I began limbering up my clapping hands. Those girls in costume looked amazing, and I couldn’t wait to find out what was going on. As it turns out, I was what was going on. I was The Event. Hooboy. Here we go again. Three. 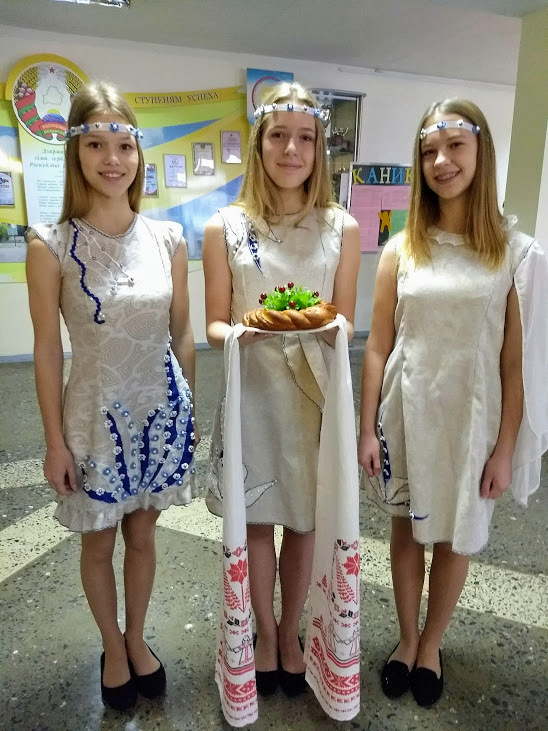 Hey, America, get this: these thirteen-year-olds speak three languages: Russian, Belarusian, and English. Even better, they speak them while wearing rad headbands and holding warm sweetbread rings. Swooping in with her camera, the chic woman (teacher? headmistress?) posed us for some photos, allowing me the opportunity, for the fiftieth time since I’ve been in Belarus, to regret that I forgot to lose twenty pounds from my frame and twenty years from my face before leaving the States. Those long lenses forgive nothing. Once the clicking ceased, the entire group was shepherded upstairs to the teacher’s lounge to deposit coats and purses before being whisked down several more long corridors into a classroom. The strongest sense memory I will take from my time in Belarus will be of the sound of high heels clicking down dim corridors followed by the whoosh of a door opening before I am ushered into a bright room, blinking dumbly under the florescence as a crowd of expectant faces comes into focus. Oh, hey, hi. It’s me. A lady who sometimes goes five days without donning underwear when she’s in that glamorous place called USA. On this particular day, the desks were full of English teachers; Helen, the long-lens lady, and the three bedazzled students filed into the remaining seats. As I centered myself at the front of the room, everyone took out notebooks and removed caps from pens. Panic clutched my chest: “So maybe I should have prepared something. Because it’s looking like notes will be taken.” Everyone in the room, including me, wondered what I would be talking about. Trying to break the ice, I asked the assembled women a few questions about their work. Two or three were willing to speak, so that helped pass twenty seconds. Quickly taking stock of my surroundings, I registered that there was no computer in the room, so I couldn’t plug in my flash drive and pull up one of my several prepared slideshows. And there was no whiteboard in the room, so I couldn’t dig out my markers. Hmmmm. Well, there was chalk. because, of course, the whole point was that they wanted to hear a native English speaker emit words from her mouth. Finally, the woman with long blonde hair in the back corner spoke. I loved that woman with long blonde hair in the back corner. YOU DON’T SAY HEY I WONDER WHAT THAT FEELS LIKE TO BE A TEACHER IN A CLASSROOM WHERE NO ONE WANTS TO TALK IS IT MAYBE SWEAT-INDUCING? Running with the brave teacher’s comment, I launched into some responsive blather about how the problem with students in American classrooms is getting them to shut up — chuckles all round for that one — before frantically trying to come up with descriptions of what I’ve done in the past two months with Belarusian students that has gotten them talking. As long as I was on a random verbal meander, I threw in things I do in my teaching in Minnesota, passed around a handout regarding writing as a process, mentioned letting students use their phones as part of activities, explained the slang word “stan,” maybe mentioned that Beyonce’s sister Solange has a new album coming out, and emphasized that good communication isn’t perfect communication but, rather, when a message lands with an audience despite its imperfections. Case in point: the previous twenty minutes of my life. Yes, of course. As we do. How could I have failed to anticipate this would be part of the deal? Over the next few minutes, as I asked questions about cakes and chocolates, most of the teachers filtered into the room. I was excited for the chance to sit around a table together and talk with them more intimately, outside the construct of a traditional classroom layout. Truly, sitting at a table in a small group, face-to-face, is where the best exchanges take place, all the better when there’s chocolate. 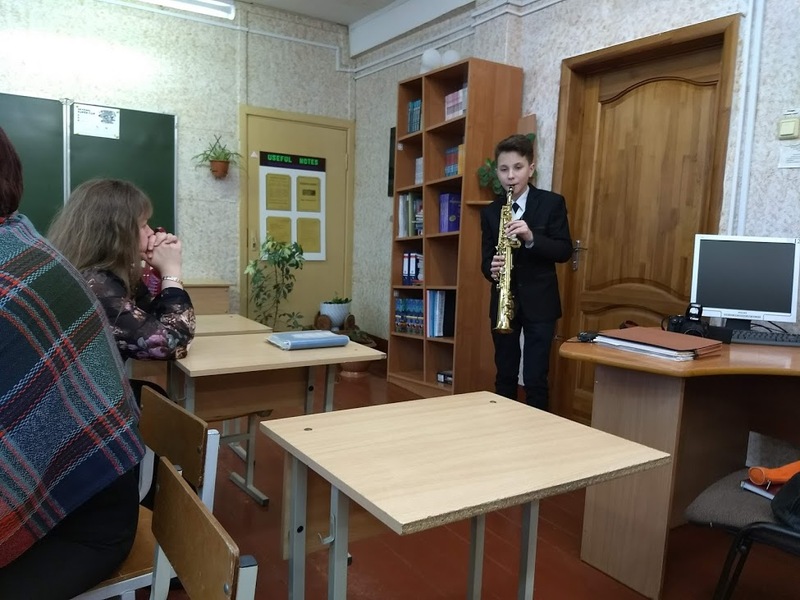 I had underestimated this gymnasium’s ability to make a visitor feel special, however; just as a few teachers and I started to relax into conversation, the door opened, and in walked the cutest, most dapper, best-prepared young saxophone player I’ve seen since my own son played that instrument. For the next ten minutes, conversation was impossible, but who wants to talk when “Strangers in the Night” and then Billy Joel and The Beatles are being played? Helen was the most-attentive audience member — clearly a mother of a young son herself. 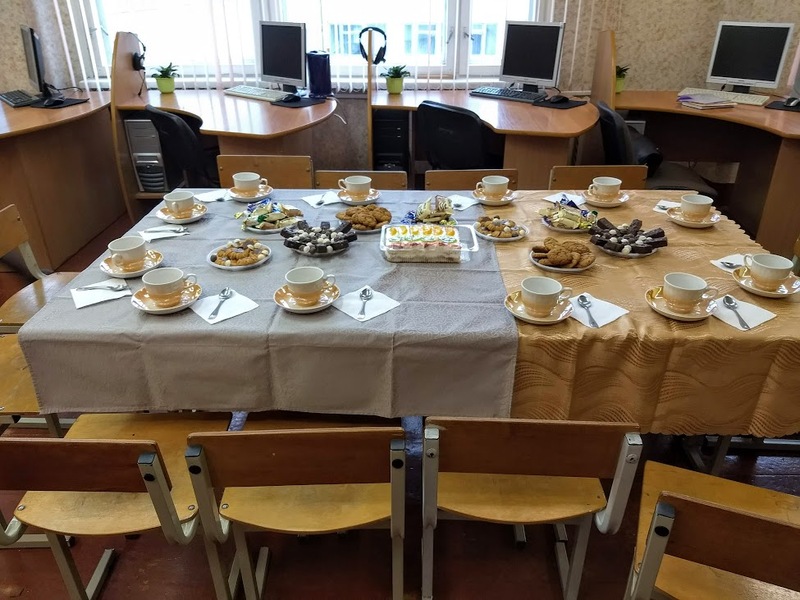 When Pavel’s performance finished, we teachers sampled the tasty cake, drank a few cups of tea, and talked about the use of computers in language teaching (turns out it would be more effective at this gymnasium if the internet worked reliably and with speed). A couple of the teachers spoke not at all, but later, when I told Helen I had worried I was boring them or making them wish I would leave, she assured me being low-key and passive is part of the Belarusian way, in the process reminding me that I shouldn’t always assume people’s body language is a reaction to what I’m putting out there. Sometimes people’s body language is about what’s going on inside of them. When it comes to absorbing this lesson, I am *coughcough* a life-long learner. Interestingly, it was only as we wrapped up — needing to hustle out so that Helen could get to the university for her next class — that I realized our visit had taken place during a holiday break, when students weren’t in attendance (except those who’d had the honor of being invited to perform for the American Teacher), but during which teachers had to be in the building nevertheless. Well, huh. So maybe the diversion of an unprepared native English speaker was a welcome one for at least a few of the teachers. Suddenly, I felt better about my rambling, no-topic talk, more able to accept that, for these teachers, hearing the language of their study and profession used in a way that was natural and unrehearsed might have been worthwhile. In addition to kinking itself as it learns the names here (just ask the seven Nastyas in my classes), my brain has been working hard to comprehend just how important — how valuable — native English speakers are to both teachers and students in what has long been a “closed” country. At first, I was dismissive: if people study a language and use it, then they can speak it, and that’s as legitimate as anything. When I studied French, there was no deep internal desire to get into a room with a native French speaker; it never occurred to me that this mattered. What’s more, with today’s technology, second-language learners are able to hear the studied languages spoken by natives speakers all the time as they stream videos and watch movies…so what’s the big deal? Being in the presence of live spoken English from someone who’s not running every utterance through an internal editor is a very big deal, in fact, and I’m only now really understanding how much it means to Belarusians to have us here. A live speaker can convey the dynamism of language in ways that no streamed YouTube video ever can — because a live speaker is reacting in the moment, responding to the energy and faces in the room, jumping topics and verb tenses, dropping word endings, speeding up and slowing down, adding gestures and grimaces, folding in slang and idioms without conscious thought, blurring word boundaries, asking questions, considering answers, initiating conversation. Most of all, a native English speaker puts on the spot those who have learned the language, as they say here, “artificially.” Can a person ever be confident she is using a second language effectively until she’s said something to a native speaker and seen that it has been understood? Having settled into this Belarus experience, I get that now. I get that every time I can say yes, I might affirm years of study and work for the people in the room. Or I might unwittingly have something tumble out of my mouth that is completely new and fascinating for those in the audience. Definitely, always, even if I’m a bumbling idiot, it is worth showing up. As Helen and I walked down the dim corridor, the long-lens lady’s high heels clicking satisfyingly next to us, I felt the mixture of relief and buoyancy that comes at the end of every public interaction. 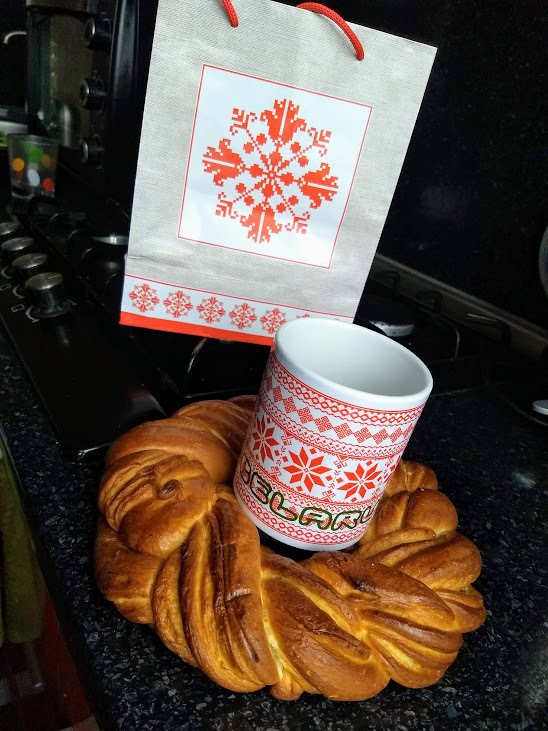 My feelings expanded into awe and gratitude a minute later when Long-Lens Lady packaged up my sweetbread before handing me a gift bag containing a souvenir mug. Gollee. These people are good. In the car, Helen and I relaxed. That had been nice. But now she was running late for her next class, and we were still fifteen minutes away. No matter, though; her students would wait, and she was glad we had the time together. When would I be able to visit her classes with first-year students and talk to them about American culture? How about some time in December, I offered, because then my daughter will be visiting, and it will be interesting for her to visit some university classes, along with providing the bonus of TWO native English speakers in the room. Oh, yes, Helen agreed, that would be great. Words flowing thoughtlessly, I continued talking, telling Helen about the friend who will visit the week after Thanksgiving and who will rent a car and bravely navigate her way from Minsk to Polotsk after dark, fresh off her flight, without any Russian in her arsenal of skills. What had I even said? And what the hell is future perfect progressive again? Frantically, I tried to pedal my mind back to 1993, shortly after the break-up of the USSR and the last time anyone explained anything like verb tenses to me. “Future” is no problem. That would be, like, tomorrow. Okay, okay, and I remembered “perfect” is something that’s “over and done with.” And I knew “progressive,” that enemy of red states. 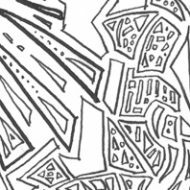 Lemme see, carry the three, minus the seven…so, putting all those concepts together, it seemed I’d used some verbs that indicated something in the future with hints of completion presented simultaneously with something ongoing? Well now. I still had no idea what I’d said, but one thing was clear: I am pretty impressive, indeed. We laughed some more, and eventually Helen had to shift gears, so my hand returned to my lap. But still. The moment stuck with me. Continues to stick with me. Will have been sticking with me for decades when I’m 90 years old. I’ve gotten used to taking myself for granted. That’s what it is to live inside your own skin, in your usual, comfortable world. I’m just a lady who likes beer and puzzles and no underwear. I’m nothing remarkable. But now. Here. In this Belarus experience. I’m starting to realize I have something special to offer just by being myself and letting words drop from my mouth. And so I need to say yes and say yes and say yes again, even when I really don’t want to, even if it leaves me wrung out and weepy. Because maybe ending up as a knotted tangle of gratitude and exhaustion is actually the goal. but I will always remember the shyness; the gifts; the sweet applause; the tentative questions; the constant requests; the lovely articles on the university website; the woman walking me home from Zumba looking up words on her phone as she tries to explain in tear-filled English a devastating fight with her daughter; the students standing up at the end of class and weakening my knees by saying, “Thank you for the interesting lecture”; the adolescents in costume on a day off from school carefully enunciating their scripted lines because it is an honor; the boy in the front row — a different boy every week, but always, there’s the boy in the front row — who is studying IT but who loves speaking English so much he can’t be hushed; the unflagging kindness and support of my English-teacher colleagues, so many of them now treasured friends; the 19-year-old boy who messages me on Instagram to say he thinks my daily stories are so funny he hopes I never stop; the cashier at the grocery store who runs to the produce section to check the SKU number of my apples because I didn’t understand her question in Russian; the other Americans having their own versions of this experience right now, all around Belarus, who have become a family that sustains me when I think I’ll crack from missing my people back home; the teenagers who teach me new words every day, slowly enunciating pronunciation while my tongue twists; and, of course, the woman who clutched my hand in spontaneous joy over a verb tense. I will only remember the gratitude. O Mighty Crisis is obviously not an official site of the Fulbright Program or the U.S. Department of State. The views expressed on this site are entirely my own and do not represent the views of the Fulbright Program, the U.S. Department of State, or any of its partner organizations. Duh.